According to the Church of Jesus Christ of Latter-day Saints (LDS), the Garden of Eden in which God placed Adam and Eve is located in Jackson County, Missouri, near the town of Independence. According to Mormon belief, an Israelite named Lehi journeys with his family from the Middle East to the Americas. Lehi's descendants divide into two tribes, the Nephites and the Lamanites, named after two of Lehi's sons. The Nephites, initially more prosperous and religious, become corrupt over time and are locked into centuries of warfare with the nomadic Lamanites, whom Mormons consider the ancestors of Native Americans. Jesus Christ visits the Americans. Courtesy: Intellectual Reserve Inc.
After his crucifixion and resurrection, Jesus Christ appears in the Americas and preaches to the Nephites. Christ's appearance inaugurates a period of harmony with the Lamanites that lasts 200 years, but eventually the tribes fall into conflict again. A Nephite prophet named Mormon has been writing the story of his people. On the eve of a climatic battle with the Lamanites, Mormon turns over the core of what will become known as the Book of Mormon, transcribed on gold plates, to his son Moroni. Mormon is mortally wounded in the battle at a place called Cumorah, and the Nephites are nearly obliterated, but Moroni survives another 36 years and adds material to the Book of Mormon before sealing up the plates in 421. June 1: Brigham Young is born in the town of Whitingham to a family of Vermont farmers. December 23: Joseph Smith, Junior is born in Sharon, Vermont, fifth child of Lucy and Joseph Smith, a hard-luck farmer whose family moves frequently as his business ventures fail. Joseph, Sr. and his sons spend part of the warm weather months treasure hunting using various divination tools, including seer stones that, when viewed at the bottom of a hat, are said to convey special sight. The Smith family moves to Lebanon, New Hampshire, where their financial situation improves and the children are able to begin school. A local typhoid epidemic kills 6,000 and infects the Smith children. Although none die, young Joseph develops a leg infection that doctors initially think will require amputation. A novel type of surgery saves the boy's limb, but he must use crutches for the next three years and will walk with a limp thereafter. Following a third straight year of crop failure, the Smith family moves to Palmyra, New York, a town of 4,000 situated near the planned route of the Erie Canal. Palmyra lies within an area known as the "Burned-over District" for the evangelical fervor of its residents. Young leaves his family, who have settled in New York, and sets out on his own as a carpenter and handyman. Joseph Smith, now 14, has become increasingly troubled by denominational differences among local Christians, but remains unsure which church is the right one to follow. One spring morning, he goes into the woods and witnesses a pillar of light descending from heaven, followed by an image of God and Jesus Christ (who are perceived by Joseph as separate "personages") forgiving his sins and warning Smith that all denominations have strayed from the truth and he should not join any of them. This event, known to Mormons as the First Vision, does not dramatically change Smith's life. He continues to work the farm and treasure hunt with his father, and when he mentions the vision to a local minister, he is scorned. Smith will not give his followers a detailed description of this vision until 1839. September 21: Fearing that he has fallen off the right path, Smith prays forgiveness for all his "sins and follies" and receives a vision of the angel named Moroni, who speaks of a book written on gold plates and buried in a nearby hillside. According to Moroni, the book describes the people who used to inhabit America and contains "the fullness of the everlasting Gospel." September 22: Guided by his vision, Smith locates the book in a box in the Hill Cumorah, just three miles from the Smith farm, but is told by Moroni that he cannot take the gold plates yet; instead he must return on September 22 for each of the next four years and be instructed on the mission God has in store for him. When Smith attempts to touch the box anyway, he receives a shock and is thrown to the ground. November 19: Joseph Smith's eldest brother Alvin dies, putting greater financial strain on the family. October: Smith and his father join a treasure hunting expedition 135 miles away in Harmony, Pennsylvania. No treasure is found, but Smith meets and falls in love with 21-year-old Emma Hale while boarding at her father's house. March: A criminal complaint is sworn out against Smith for fraudulent use of seer stones. He admits to using them in the past but says he has now given up the practice. January 18: Joseph Smith and Emma Hale marry against her father's wishes. September 22: Now that four years have passed, Smith successfully digs up the gold plates. Warned by Moroni not to let anyone else see them, he does show his mother an unusual pair of spectacles with precious stones where the eyepieces would normally be. These stones are to help Smith translate the book from the "reformed Egyptian" in which it is written. But rumors of a golden Bible have begun to circulate in the neighborhood, so Joseph and Emma Smith must flee potential thieves. Financially assisted by a local farmer named Martin Harris, the couple sets out for Harmony, hiding the gold plates in a barrel of beans. December: Emma's father allows the couple to stay in a small house on his property, and Joseph begins the task of translating the writing of the gold book, using his interpretation device and dictating the results to Emma. April: Harris, who has followed Joseph Smith to Harmony, takes up work on the book, writing down Smith's dictation. Over the next two months, they produce 116 pages of text, but then Harris takes it back to Palmyra to show his doubting wife and loses the only copy. June 15: Emma gives birth to a child, Alvin, who dies that same day (only five of the couple's 11 children will live beyond infancy). When weeks pass with no word from Harris, Joseph heads back to Palmyra and discovers the loss. Begging for forgiveness, he is visited by an angel who takes the gold plates for a time as punishment for Smith's indiscretion. September 22: Smith gets the gold plates and interpretation device back. April 5: Young schoolteacher Oliver Cowdery arrives in Harmony and becomes a scribe for Smith as he resumes the translation of the gold plates. The two men finish work in June. May 15: In the midst of their translation, Cowdery and Smith take to the woods to pray and are visited by John the Baptist, who confers the Aaronic priesthood upon them. This is a critically important event in the history of the church since it precedes the restoration of the church. John the Baptist also tells the two young men that the Melchizedek Priesthood will also be restored and that when it is restored, it will give them power to "lay on hands for the gift of the Holy Ghost." Then, in anticipation of the organization of the "Church of Christ," John the Baptist announces that Smith will be "the first Elder of the Church" and Cowdery the second. The two men then baptize each other in the Susquehanna River. June: Smith, who has completed the translation at Peter Whitmer's farm in Fayette, New York, receives a copyright for The Book of Mormon. Eleven witnesses will later sign statements that they have seen the gold plates from which The Book of Mormon was translated; three of them, including Harris and Cowdery, further assert that they saw an angel bearing the plates. August: Smith locates a publisher for the Book of Mormon in Palmyra and typesetting begins. The 5,000 copy initial print run is financed by a $3,000 mortgage on Harris' farm. March 26: The Book of Mormon is published, each copy selling for $1.25. Young, a practicing Methodist who has moved to the area near Palmyra with his wife, reads the Book shortly after publication and will be baptized as a Mormon two years later. April 6: The first organization meeting of the LDS is held at the Whitmer farm with about 50 people in attendance. Smith and Cowdery are ordained "elders," and Smith will also become known as "prophet." The first four Mormon missionaries (including Cowdery) head west that October. June: Smith is arrested and charged with "being a disorderly person" for his preaching, but is acquitted. October: The missionaries taking The Book of Mormon's message to the Indians in Ohio and Missouri have stopped in Kirtland, Ohio. A Baptist minister named Sidney Rigdon decides to join the LDS and bring his 100-member congregation with him. Soon afterward, a vision instructs Smith to move the nascent Mormon community west to Kirtland. Other missionaries proceed to Missouri and settle in Independence. February: Joseph and Emma Smith reach Kirtland; other church members will join them in the spring. For the next six years, Smith will be based there and will announce some 65 revelations, most pertaining to church structure and organization. The concept of the gathering is put in place during this year. June: After missionaries reach Missouri and settle in Independence, Smith leads a group of Mormons from Kirtland west to Independence, which, according to the story, God has revealed will be the gathering place for Mormons and the site of a "New Jerusalem." In August they lay the cornerstone for a temple; within a year, more than 800 more church members have moved to the area. Yet Smith decides to keep his headquarters in Kirtland. Joseph Smith begins work on an inspired translation of the Bible. Smith and two counselors form the First Presidency of the Latter-day Saints, with authority over all church matters. March 24: A mob resentful of growing Mormon influence tars and feathers Smith in front of his Kirtland house. Work begins on a grand Mormon Temple in Kirtland. It will take three years to complete and measure 55 by 65 feet, soaring 110 feet high. The first collection of Smith's revelations is prepared for publication as The Book of Commandments. Summer: The Missouri Mormons begin to suffer violence at the hands of other locals; their printing press (on which The Book of Commandments is being printed) is destroyed in July. Mob violence will drive the Mormons out of Jackson County and across the Missouri River to Clay County in November. The pages of The Book of Commandments are rescued from the muddy streets and bound, creating the first published collection of Smith's revelations. September: Brigham Young, now a widower, arrives with his two young children in Kirtland. One hundred thirty eight of Smith's revelations are published in a book called Doctrine and Covenants. Included among these are the sixty-five revelations published in The Book of Commandments, plus seven "Lectures on Faith" prepared by Joseph Smith, which are not described as revelations. The Missouri Mormons are forced to leave Clay County for the more remote Caldwell and Daviess Counties in the northern part of the state. March 27: One thousand worshippers begin a week of temple dedication ceremonies in Kirtland. Witnesses report rushing winds, a pillar of fire, and the presence of angels. During the dedication, a critical visionary experience occurs in which the prophet and Oliver Cowdery, who have retired behind a veil that separates an elevated pulpit from the rest of the temple, see a personage they believe is Jesus, accepting the temple as a place where he will manifest himself to his people. In addition, they see the Old Testament prophets Moses, Elijah, and Elias, who commit into LDS hands the keys of the gathering of Israel and the new dispensation of the fullness of times. November: Smith forms the Kirtland Safety Society Bank, but a national economic panic begins in March 1837 and soon leads to his bank's collapse. Accusations of both financial and sexual impropriety arise. Mormons begin evangelizing in England. 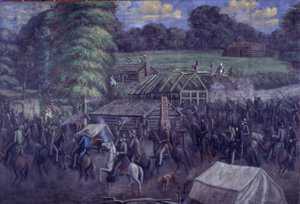 C.C.A Christensen's Depiction of Missouri Militia raid on the Mormon settlement of Haun's Mill, ca. 1865. Courtesy: Brigham Young University Museum of Art. January 12: Smith escapes Kirtland and heads for Missouri, arriving there with his family in March. Many of the Ohio Mormons follow, and soon there are thousands of church members in the settlement of Far West in Caldwell County. Smith makes plans for a new temple and excommunicates old friends and current adversaries including Cowdery, who has turned against him, accusing him of adultery. But peace with neighboring non-Mormons proves elusive. July 4: While giving a patriotic oration, Rigdon promises that Mormons will defend themselves and warns of a "war of extermination" with hostile neighbors. August 6: Non-Mormons attempt to prevent church members from voting, leading to a bloody melee. In the charged aftermath of the violence, Missouri Governor Lilburn Boggs orders all Mormons to either be driven from the state or wiped out. October 30: Stirred up by the governor's decree, an anti-Mormon mob massacres church members at Haun's Mill, killing 17, including unarmed children. Opposition to the Mormons rages. Smith is arrested, charged with treason, and sentenced to death, his life only spared when the officer ordered to carry out the execution refuses. Smith instead will spend the next five months in jail. Led by Brigham Young, the Missouri Mormons reach safety in Illinois, where they are welcomed by a sympathetic populace. April: While being moved from one trial location to another, Smith is permitted to escape and makes his way to Illinois. There he buys land for a new settlement named Nauvoo on the banks of the Mississippi River, about 200 miles from St. Louis. November 29: Smith travels to Washington to meet President Martin Van Buren. He demands compensation for the Mormon losses in Missouri. Van Buren expresses sympathy but says he "can do nothing." December: The Mormons receive a city charter establishing expansive home rule and a local militia. After the first mayor is excommunicated, Smith becomes both mayor and military leader. Nauvoo quickly grows and within four years is nearly the size of Chicago, the population bolstered by an influx of Mormon converts from Europe. 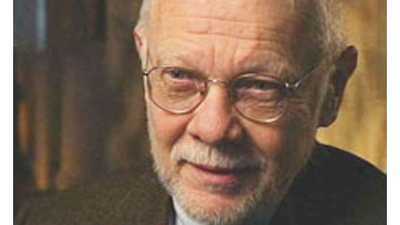 July 12: Smith announces revelations about two new practices. First, the dead can be baptized. [This practice is disclosed as a part of three different revelations.] Second, polygamy, or plural marriage, is not only permissible but in certain cases required. The second pronouncement, in particular, causes great division among Mormons, with Brigham Young stating he would rather die and Joseph Smith's wife Emma expressing opposition even though the revelation (now Section 132 in the LDS Doctrine and Covenants) expressly directs Emma Smith to accept plural marriage.) And although the doctrine will not be publicly announced for nearly a decade, rumors quickly spread, increasing anti-Mormon feeling. Joseph Smith will eventually have more than 25 wives, while Young will come to embrace the doctrine, take 20 wives, and father 57 children. Smith declares that he will run for president of the United States, announces in a sermon that those who obey God's commands can become gods themselves, and orders the destruction of an opposition newspaper, the Nauvoo Expositor. The ensuing outcry leads to criminal charges, and after starting to flee, Smith changes his mind and surrenders to state authorities. June 27: While in jail, Joseph Smith and his brother Hyrum are shot and killed by members of a mob. No one will ever be convicted of the crime. A struggle for the leadership of the Mormon movement follows, in which the Saints are divided over whether to follow (a) the Council of the Twelve; (b) the surviving members of the Smith family; (c) the remaining members of the First Presidency; or (d) a variety of other potential leaders such as James J. Strang or Lyman Wight. During these two years many of the Mormons who had settled in Nauvoo leave the area, but most remain. February 4: Facing further harassment, thousands of the Mormons, but not all, leave Nauvoo on a great march west. Some of them follow James J. Strang and settle in Michigan; others follow Rigdon to the east, while others settle in other parts of the Midwest. Brigham Young, who is head of the Quorum of the Twelve Apostles, a church leadership body, directs the exodus. Their winter departure causes great hardship, but in four months the Mormons will travel more than 300 miles to temporary quarters along the Missouri River where it divides Iowa and Nebraska. There they will wait out the winter of 1846-47 before beginning their westward trek again. April 25: Mexican troops fire on American soldiers who have been provocatively placed by President James Polk in a disputed part of Texas. The U.S. declares war on Mexico in May, and a Mormon Battalion of some 500 soldiers enlists, although they see no action. April 30: The Nauvoo Temple is completed and dedicated. During the days and nights of the following ten months, great numbers of Latter-day Saints go through the temple to receive their "Endowments" and a substantial number of polygamous marriages are solemnized in its sealing rooms. Main Street, Salt Lake City, looking south from First North. Courtesy: Church History Library, The Church of Jesus Christ of Latter-day Saints. April: The Mormon pioneer company led by Young leave their winter quarters in western Iowa and head west. Young has been plagued by self-doubt, but a February vision of Smith renews his confidence. 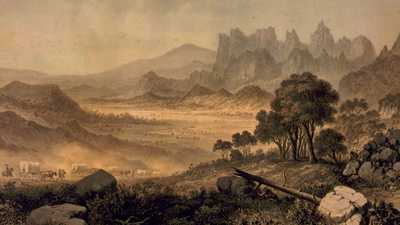 July 24: A Mormon advance party including Young reaches the valley of the Great Salt Lake, and Brigham, who will be made church president later in the year, confirms that this is where the Mormons will settle, beyond the boundaries of the United States. His followers promptly mark off an acre that will be reserved for a temple and then begin laying out city streets and setting up irrigation systems. September: American soldiers led by General Winfield Scott capture Mexico City and end the war. February: In California, Mormons working for John Sutter, whose sawmill on the American River is the site of the start of the Gold Rush, make a large gold find at what becomes known as Mormon Island. March 10: Congress approves the Treaty of Guadalupe Hidalgo, which cedes much of Mexico's western territory, including Utah, to the United States. 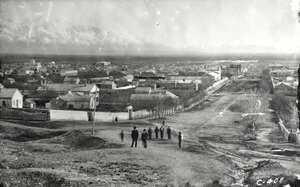 Beginning in 1848, thousands of Mormons make the trek from Winter Quarters to the Great Salt Lake Valley. In the first months they suffer terribly, but they begin to create a "kingdom in the tops of the mountains." Young sends groups of Mormons to settle in various parts of the intermountain west. A provisional State of Deseret is organized, but it is not approved by the U.S. Congress. Instead, as a part of the Compromise of 1850, Deseret is renamed Utah and made a U.S. territory. Brigham Young is appointed governor of the Utah territory. The doctrine of polygamy is made public outside the church, leading to widespread condemnation. Some 20,000 Mormons now live in the Salt Lake area. April 6: The Mormons who rejected the leadership of Brigham Young and never accepted the idea that polygamy was revealed doctrine hold a conference in Wisconsin to found the Reorganized Church of Jesus Christ of Latter Day Saints. This organization brings together many of the Saints who believe that the church should be led by members of the Smith family. Mormon missionaries establish a settlement in what will become Las Vegas. Settlements are also established in San Bernardino, California and in the Wind River area of Wyoming. President James Buchanan, reacting to reports that Young is ruling Utah as a personal theocracy, declares the territory in rebellion and sends 2,500 soldiers west from Kansas. While offering no armed resistance, the Mormons harass the military's supply trains. September: Mormon militia led by John Lee and acting in tandem with a group of Native Americans attack a wagon train of settlers from Arkansas, slaughtering 120 men, women, and children in what becomes known as the Mountain Meadows massacre. Only 17 children under the age of eight are spared. Young's possible role in authorizing the atrocity will be hotly debated over the years, but the evidence suggests that at the very least, he covered up the truth of the crimes committed. After a new governor is allowed to take control in Utah and federal troops march unopposed through Salt Lake City, Buchanan declares the "Mormon War" over and issues a blanket amnesty. But the continuing practice of plural marriage will prevent Utah's admission to the Union as a state for the next four decades. 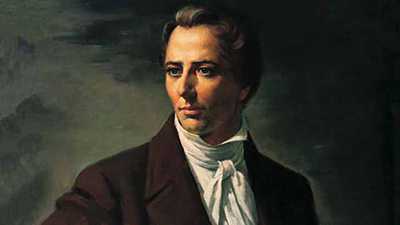 Joseph Smith III, the Mormon prophet's eldest son, becomes the president of the Reorganized Church. Its headquarters are established in Independence, Missouri. The Morrill Anti-Bigamy Act criminalizes plural marriage in U.S. territories, but President Abraham Lincoln declines to enforce it. The LDS Church (headquartered in Salt Lake City) has almost 60,000 members. Mormon laborers assist with the construction of the Transcontinental Railroad. Anti-polygamy activity increases, and Young is charged, though not convicted, with that offense. John D. Lee becomes the only individual brought to trial for the Mountain Meadows massacre, but the proceeding ends with a hung jury. Lee is re-tried and convicted of murder. March 23: Lee is executed at Mountain Meadows. August 29: Brigham Young dies. Fifty thousand people attend the viewing. The Church of the Latter-day Saints has 109,894 members. The Supreme Court upholds the Morrill Act. The Edmunds Act declares polygamy a felony and disenfranchises all who practice it. By 1893 more than a thousand Mormons have been convicted of "unlawful cohabitation." The Edmunds-Tucker Act disincorporates the Mormon Church and gives the federal government all church property above $50,000. The Supreme Court will subsequently uphold this law. In the Manifesto, church president Wilford Woodruff renounces polygamy on behalf of the LDS, although this act is never described as a revelation. The Church of the Latter-day Saints has 201,047 members. January 4: Utah is granted statehood. The church threatens polygamists with excommunication and subsequently cooperates with federal authorities in prosecuting them. The LDS Church has more than a million members. A federal raid on the Short Creek polygamist community creates mass sympathy for the practitioners of plural marriage, and the LDS Church stops cooperating with these prosecutions. The Reorganized Church of Jesus Christ of Latter-day Saints changes its name to the Community of Christ. 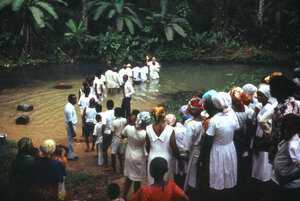 Mormon missionary baptizing line of converts. Today there are nearly 13 million members of the Church of Jesus Christ of Latter-day Saints worldwide, with more church members living outside than inside the United States. The Community of Christ has more than 150,000 members and there are several schismatic groups who continue to call themselves Reorganized Latter Day Saints who probably have another 100,000 members. In addition, a variety of Mormon Fundamentalist groups continue to practice polygamy. The estimated number of fundamentalists is somewhere between 30,000 and 60,000. Until September 1857, the Mormons had been the victims of violence more than its purveyors. That all changed with the darkest incident of the Mormon War, the atrocity known as the Mountain Meadows massacre.